Thailand's 'powers that be' move to dissolve globalist-backed, criminal proxy-party. Bangkok, Thailand July 9, 2011 - It may come as a surprise to some, but convicted criminals running proxy political campaigns from abroad are illegitimate and may face legal troubles should they manage to win an election. Surprise, anger, and even threats of violence would summarize the reaction of globalist-stooge Thaksin Shinawatra's proxy political party who is now facing dissolution on the grounds that banned politicians (namely convicted criminal Thaksin Shinawatra himself) were involved in its campaign. 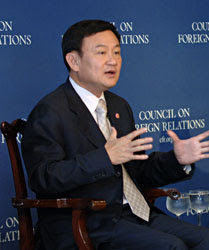 Thaksin's foreign-backers, including the policy wonks and war criminals amidst the Fortune 500-funded Council on Foreign Relations (CFR) have outright warned Thailand that, "if traditional powers attempt to overthrow the result, either through judicial interference or an outright coup, Washington should come down hard on Thailand, including potentially canceling many aspects of the United States’ close military relationship with Thailand." Of course, it is unthinkable that Thailand should stand idly by while subjected to such overt criminality. Named the Peua Thai Party (PTP) and led via overt nepotism by Thaksin Shinawatra's own sister Yingluck Shinawatra, it contested and narrowly won Thailand's recent July 3rd elections. Thaksin himself, a convicted criminal evading a two-year prison term, would call sister Yingluck his "clone." The geopolitical significance of Thaksin Shinawatra and his proxy party's recent victory lies in the foreign support that stands behind him. 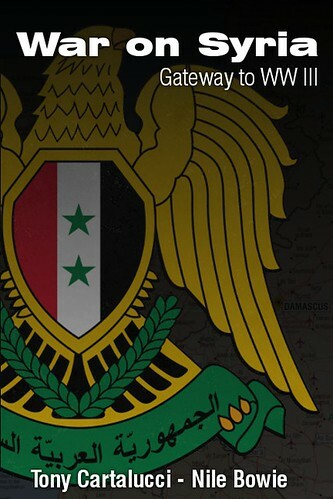 Ousted from power in 2006 via a peaceful and orderly military coup, he has since been represented by the global moneyed elite via their lobbying firms, including Kenneth Adelman of the Edelman PR firm (Freedom House, International Crisis Group, PNAC), James Baker of Baker Botts (CFR), Robert Blackwill of Barbour Griffith & Rogers (CFR), Kobre & Kim, and currently Robert Amsterdam of Amsterdam & Peroff (Chatham House). Meanwhile, his street mobs dubbed the "red shirts" have received rhetorical support by US-funded NGOs like Prachatai which received 1.5 million baht from the Neo-Con lined National Endowment for Democracy. 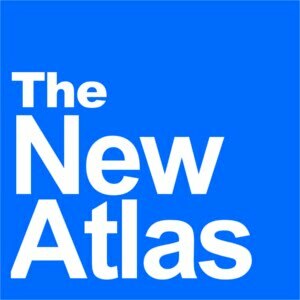 His party's reinstatement would usher in a new era of Washington involvement and influence throughout Southeast Asia with Thaksin as the conduit, leading drives to promote free-trade, regional supranationalism, and economic liberalization, all in an effort to check China's rising regional influence. The jubilant corporate-owned media hailed Thaksin's proxy party's narrow win as a "landslide victory" granting him a "sweeping mandate." In reality, only 35% of eligible Thai voters chose Thaksin and his proxy Peua Thai Party. Photos: As charges are leveled against Peua Thai Party regarding the involvement of "banned politicians" in their campaign, they will be hard pressed to come up with an excuse as to why a convicted criminal was phoning in to rallies and emblazing his image on campaign posters across the country. 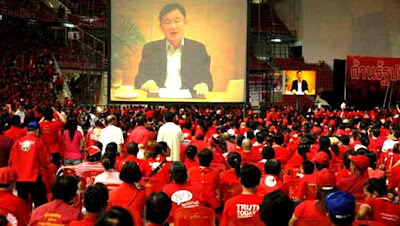 The accusations leveled against Thaksin's proxy party are based on several overt facts. Most obvious was the campaign slogan which literally was "Thaksin thinks, Peua Thai does." Additionally, Thaksin made frequent video phone-calls to various political rallies from his luxurious hideout in Dubai and had his image emblazed on rallying stages and campaign posters across the country. The very nomination of his own sister to run in his place and having been previously unheard of in Thai politics smacks of classic Shinawatra nepotism. In 2007 Thaksin's brother-in-law took over the leadership of his political party while he was in exile. Undeniably Thaksin was/still is most certainly involved and very much illegally a part of Peua Thai's campaign. Globalist in their own words confirm "Thaksin thinks, Peua Thai does"
AFP "Thai poll rivals in final push for vote:" Polls show the main opposition Puea Thai Party, allied to fugitive former premier Thaksin Shinawatra, enjoying a lead over current leader Abhisit Vejjajiva's ruling Democrats ahead of Sunday's election. " Sky News continues, "Many think Thaksin will continue to call the shots if his party wins the vote, and its campaign slogan -- 'Thaksin thinks, Puea Thai does' -- appears to leave little doubt. Yingluck Shinawatra, tipped to become Thailand's first female prime minister, is a political novice widely seen as the political proxy of her older brother, who describes his sibling as his 'clone'." Guardian "Yingluck Shinawatra: Thailand's new PM steps out of her brother's shadow:" "The party she fronts used the slogan "Thaksin thinks – Puea Thai does" and her brother has described her as his "clone" – later caveating that he meant she shares his way of thinking." The Guardian continues, "In fact, Thaksin was succeeded by his ally Samak Sundaravej and his brother-in-law Somchai Wongsawat – both disqualified from office – before he asked his youngest sister to stand." TIME "Thai parliament Dissolves: Let the Campaign Season Begin:" "The elected prime minister who was ousted by the army in the 2006, Thaksin lives abroad, having fled after being convicted of corruption and given a two-year prison sentence he did not serve. Pheu Thai's campaign slogan is "Thaksin thinks, Pheu Thai acts," and party executives acknowledge that Thaksin is expected to name his sister, Yingluck Shinawatra, a businesswoman with no political experience, as the party's candidate for prime minister." The Washington Post "Thaksin's sister is front-runner to become Thai prime minster:" "Yingluck’s campaign leaflets boast of Thaksin’s role: “Thaksin Thinks, Pheu Thai Does,” reads a party slogan. Thaksin, in a recent interview with Australian television, described his sister as his “clone.”"
Foreign Policy "Family Matters" "Indeed, while Yingluck is a political newcomer, her family surely isn't. She has not attempted to hide the fact that she has succeeded in large part because of her older brother, the fugitive billionaire and former prime minister Thaksin Shinawatra, who described her, from his exile in Dubai, as his "clone." Thaksin was overthrown in a military coup in 2006 -- allegedly for abusing his office and insulting Thailand's revered king -- but remains overwhelmingly popular in the rural hinterlands, where he is seen as a champion of the poor. Although he faces a two-year jail term for abuse of power, he and his supporters say the charge was politically motivated. "If you love my brother," Yingluck has asked her supporters in countless campaign stump speeches, "will you give his youngest sister a chance?" The 61-year-old still plays a central role in the Pheu Thai (For Thais) party, the latest incarnation of the Thaksin's Thai Rak Thai party, which was outlawed after his overthrow. 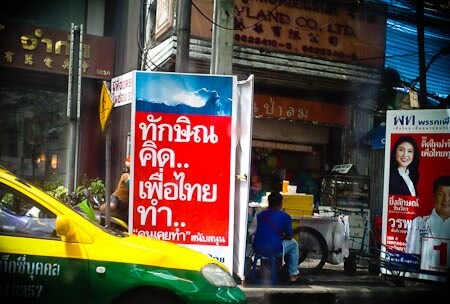 One party slogan -- "Thaksin Thinks, Pheu Thai Acts" -- is equally unambiguous about Thaksin's importance to the campaign." 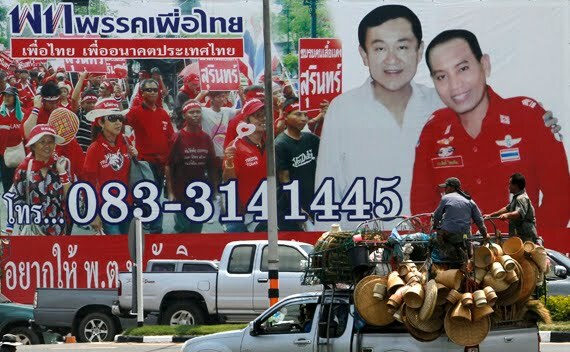 Photo: As mentioned in a myriad of foreign media publications, Thaksin's proxy party ran with the slogan, "Thaksin thinks, Peua Thai does." As Peua Thai faces charges that a convicted criminal was directly involved in their election campaign, many of the exhibits used against them in court will be of their own design and impossible to deny. When this same gaggle of foreign corporate-owned media organizations rushes to Thaksin and his proxy party's defense as he is once again excised from Thai politics via either judicial decisions made against the overt criminality of his campaign, or via a military coup to forcibly remove his despotic hereditary dictatorship from power, it must be remembered that these charges are not being drummed up by the "Bangkok elite," rather they reflect a reality that has been repeated ad nauseum by both Peua Thai itself and the foreign media that has attempted to lend Thaksin legitimacy. It is difficult to imagine how the foreign-media and Thaksin's various foreign supporters will come to his defense, especially after admitting themselves that he was running the party behind the scenes. While claims will be made that Thailand is sliding backwards as a democracy and that moves to dissolve the party constitute a "judicial coup," such voices need to first ask themselves how democratic it is for a party to trump the rule of law openly while attempting to contest an election in the first place. If Peua Thai stood on policies and not a meticulously built personality cult, it could have won the elections no matter who was associated with the party, as long as they were competent and committed to said policies. How far these charges go is anyone's guess, however if Peua Thai is dissolved, Thaksin and his foreign sponsors will once again call the "red-shirted" mobs back into the streets for another round of ochlocratic murder and mayhem. With only 35% of eligible Thai voters actually choosing Thaksin's Peua Thai Party, the myth of majority support has been shattered making such violence all the more appalling and unjustified.